Have you ever felt stuck in a rut, like you really needed to make a change to kickstart your progress, but every time you tried to do something new or change your approach, you find that not a whole lot happens? If you’ve tried this before, you can start to feel like you’re never going to get out of that rut and start making progress. You may start to fear that maybe this place you’re in and those feelings you’re having are going to be permanent. The problem may very well not be that you don’t have the capability to change. The problem may instead be in the approach you are taking to try to make those changes. You see, when we try to make changes in our lives, we like to try to tweak. The problem with tweaking is that it’s just a small incremental change that doesn’t really make a lot of progress. In order to really create a transformational change that’s going to get out of that rut and start making huge progress, we need to innovate. 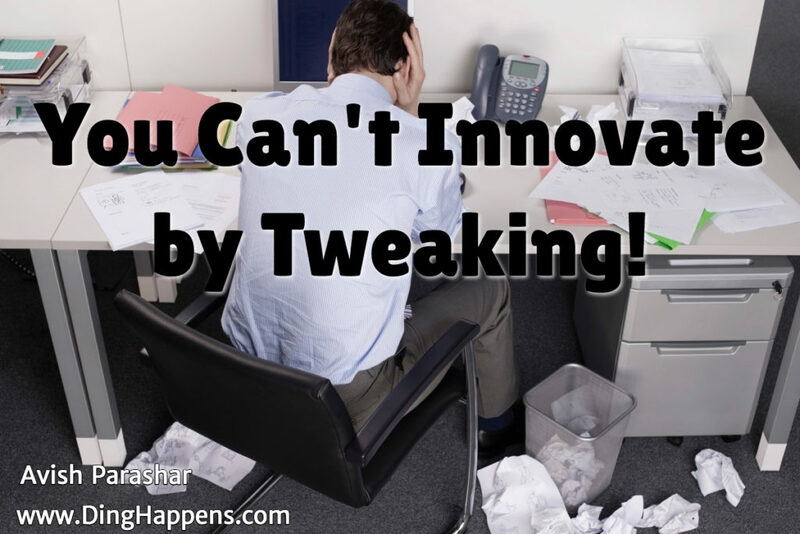 The importance here is that you cannot innovate by tweaking. By innovation, what I simply mean doing something new or doing something old in a very new way. To innovate, you have to break out of your comfort zone, throw something at the wall, and see what happens. When you tweak, you take a look at what your already doing and then try to make a small change that will slightly improve it. Tweaking is fine if you just need to make little bits of improvement or if you want to test some things out. Unfortunately, what got you to the level you’re currently at is often the thing that’s holding you back from going to the next level. The problem is that for a long time (longer than I would like to admit), I tried to make my keynote better by tweaking it. I would add in a one or two-minute segment. I would change a story. I would slightly move some things around. Using this approach, my business never really got a whole lot better because when you tweak, you tend to stay in the same arena or at the same level of success. 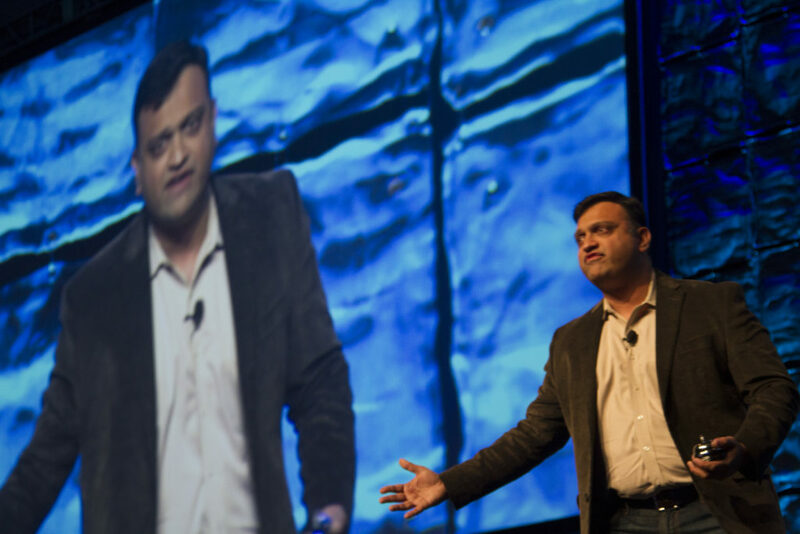 When I finally decided it was time to innovate my keynote, I made big changes to it. I added new improv games (link to video). I developed new stories. I changed the title and branding. It was after I did that – and only after I did that – that my business really took off. Not only did I start getting booked more, but I was also able to raise my fees considerably over the course of a couple of years with that new keynote. Now I find myself at the next crossroads where I’m happy with where my business is, but if I want to grow it, which I do, I need to innovate again. You have the same choice in your own life when you’re trying to get out of a rut or take your career, business, or life to another level. You can tweak by changing little components one at a time or you can make big quantum leaps by making a large change that really propels you forward. You can apply this to your business, be your small business, your department, or even a large organization. If you need to jump ahead, stop tweaking and start innovating. What is a big change you can make to propel your business forward? You could do this on a professional level in your career. You can make a big change by getting a new degree or switching roles in your current organization You can also apply this on a smaller scale. Just start doing something new that you haven’t done before as a professional. This could be part of your job or it could be external, but just simply trying to do your current work better is not going to get you a huge innovation. Finally, you can use this in your personal life. If you feel overworked, creatively blocked, or you’re just not enjoying yourself, stop trying to tweak and make small changes in your schedule. Make a big change, try something very new and different, and see what happens. We like to think that innovation occurs in “a-ha!” moments, like Isaac Newton sitting there, getting hit on the head with an apple, and discovering gravity. 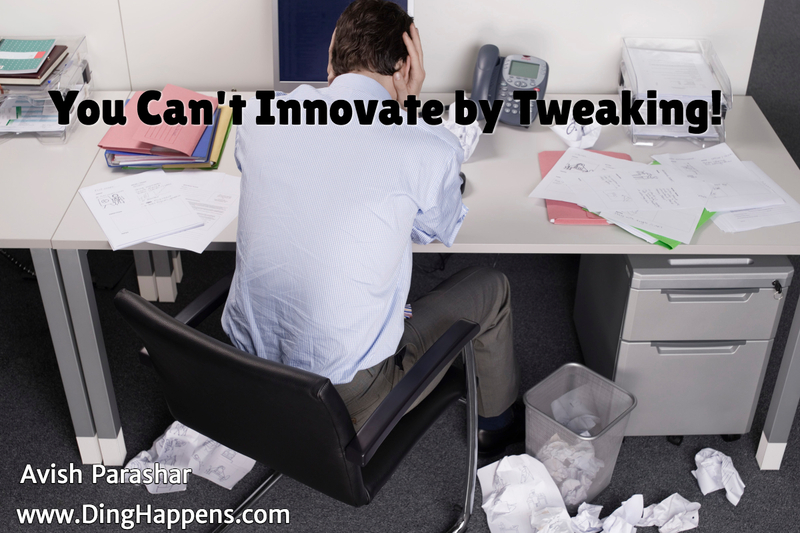 In reality, innovation is a very messy process. You get an idea, you try it out, it probably doesn’t work, and you fail. You make an adjustment, try again, over and over, until you either get somewhere or figure out that your idea won’t fly. This is where tweaking works. The initial idea is a big innovation and change. Then as you try it, you keep tweaking the approach to see if you can make it work. Because innovation is a messy process, you will mess up and your first attempt probably won’t work. Have the courage to try anyway knowing there’s a good chance it won’t work, because eventually, once you work through it, you’ll reach a whole new level if you push through that fear of failure. Try to think in terms of “learning,” not “succeeding.” That means that when you try to implement your new idea, don’t worry so much if it works perfectly. Rather, go in with the mindset of, “what can I learn from this experience?” That’s how you can tweak your innovation to eventually make it work. This is a tremendous creative exercise. It forces you to get creative and let go of everything you have done to this point. This is just a thought experiment because you’re not going to actually throw everything away. When I redid my keynote, about 60% of it was the same stuff that I used to be doing, but 40% was completely different. But adding that constraint of not being able to do anything your current way forces you to innovate. By definition, you cannot tweak if you can’t do anything you’ve been doing. This is all about raising the bar. Ask yourself a problem, or set a challenge for yourself that you don’t currently know the solution to, and that you can’t just pop onto Google to get the solution. This is one of the best ways to force yourself to raise the bar, be innovative, and create breakthrough transformations. The next time you find yourself stuck, lagging behind the competition, or feeling like you’re capable of something more, stop tweaking. Start innovating. Raise the bar. Change the game, and get yourself moving again. 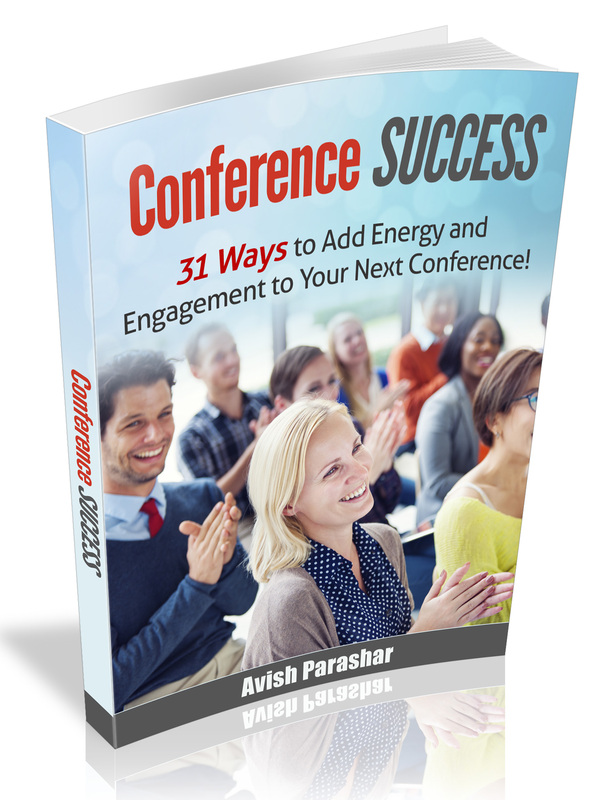 Do you want Avish’s help in getting out of a rut by innovating on a personal or individual? Contact him now to discuss how he can help you with one on one consulting options.